Venous thromboembolism (VTE) during or after assisted reproductive technologies (ART) is predicted to rise due to the increased number of women undergoing this technique. We present data collected in the RIETE registry up to October 2016. Overall, 41 (0.6%) out of 6,718 women of childbearing age with VTE had an ART-related event. Most of them underwent autologous ART cycles; 23 had isolated deep vein thrombosis (DVT) (56.1%), 12 isolated pulmonary embolism (PE) (29.3%) and 6 simultaneous occurrence of both the events (14.6%). VTE occurred in 20 successful and 21 unsuccessful (i.e. not resulting in a clinical pregnancy) ART cycles. No recurrence was observed at 90 days. 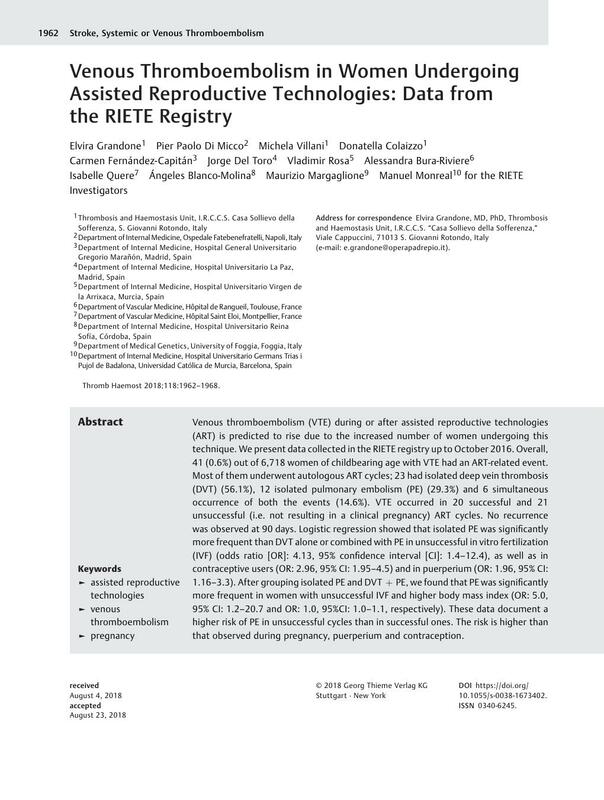 Logistic regression showed that isolated PE was significantly more frequent than DVT alone or combined with PE in unsuccessful in vitro fertilization (IVF) (odds ratio [OR]: 4.13, 95% confidence interval [CI]: 1.4–12.4), as well as in contraceptive users (OR: 2.96, 95% CI: 1.95–4.5) and in puerperium (OR: 1.96, 95% CI: 1.16–3.3). After grouping isolated PE and DVT + PE, we found that PE was significantly more frequent in women with unsuccessful IVF and higher body mass index (OR: 5.0, 95% CI: 1.2–20.7 and OR: 1.0, 95%CI: 1.0–1.1, respectively). These data document a higher risk of PE in unsuccessful cycles than in successful ones. The risk is higher than that observed during pregnancy, puerperium and contraception.